How slow is "slow motion"? Am I supposed to do just 2 punches within 10 secons, and 2 bicep curls within 30? Just ran through it with my 10-lb. bells. Did 4 'slo-mo-punches' - 2 each side - in 10 seconds. Felt quite slow. Yeah ... 2 bicep curls in 30 seconds would have been rough. May try to slow it even further tomorrow. Thanks for asking the question. Sitting in my basement waiting for the temps to rise (started at 35f). DaithiMeyer How did it feel? Following the suggestion and EC, I need to get a pair of 3kg, or 2. I have never used any dumbbells. I agree with you. 2 curls in 30 seconds seem hard to do (too slow)... I just have no idea. kandy ... 3kg = ~6.5 pounds. My recent experience suggests that will be a solid workout. My thinking is that the slower motion is to work the shoulders rather than the arms. The slow (15 second) 'curls' would seriously stress the biceps. It didn't hurt, but the 'dumbbell hold' started with my arms outstretched and ended with them drooping, sadly. Now I have another question which is weight. It seems that the workout is designed using light weight, otherwise it would say 8kg, like many other Darebee dumbbell workouts suggest. I am sure 1kg is light for me but I am not sure about 3kg, and I want to buy only 1 pair. What should I do here? kandy in reverse order: buy a 2kg if possible that way you cover all bases. On your other question, the idea is to work the tendons and muscles for 30 seconds. If you slow it down so that you end up doing two punches (one each arm) in 10 seconds that's pretty good. There is a scientific reason why slowing it down is good - I won't go into it here otherwise I will end up writing an article. Suffice to say, the slower the better. Do you have any suggestion if I want to use the 2kg dumbbells for increasing my forearm and grip strength? This is mostly about the tendons, right? I am not really interested in training the bicep muscles for some reason. kandy grip strength is used as a reliable indicator of overall strength. Just holding the weights tightly as you do exercises helps. 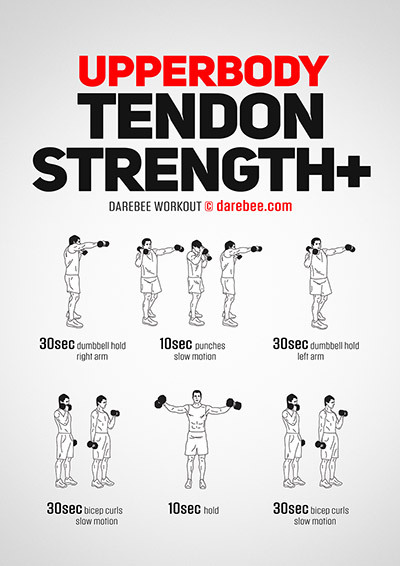 Damer I was intrigued by your words on forearm strength being the indicator of overall strength. Can you elaborate? And does it mean if the upper arm gets strong, then the forearm and grip strength will follow? My right arm seems to have a naturally stronger grip strength than my left side, but I don't think my right forearm itself is stronger than my left because I rely on my left side more for strength in martial art training. The largest circumference of my left forearm is a bit bigger than my right. Pretty sure my right biceps is stronger. In short, I train my left forearm more often. But my right arm can easily triumph the left if I start training it, from my experience. It's more than fine if you write an article on this. kandy while there are lots of different test to measure upper body strength, grip strength has been found to be one of the most reliable ways to do that, plus it is a predictor of overall health moving forward. The reason for that lies in its complexity: four flexors (digitorum profundus, digitorum superficialis, digiti minimi brevis, pollicis longus), one extensor (digitorum), and three intrinsic muscles (lumbricals, interossei, adductor pollicis). Grip strength itself is multi-faceted. There is the crushing grip (think of a hard handshake), the pinching grip between fingers and the hanging grip which is what you use when you carry a full shopping bag a few hundred meters. All this means that you can't get stronger without your grip strength improving. The reason grip strength is such a good indicator of overall strength, endurance and health lies in the complex circulatory system supplying all the different muscles and tendons with blood and nutrients. So it is an indicator of cardiovascular health. A useful study to look at is this one here. It examined pretty much all of that. Another study that looked at cardiovascular health in relation to grip strength and was carried out in 17 countries that included 139,691 adults between the ages of 35 and 70 found that a five-kilogram (about 11 pounds) decline in grip strength is linked to a 17 percent increased risk of dying from a heart attack or stroke over a four-year period. That study is here. So, moving forward yes, it is important to have as balanced a handgrip between left and right side as possible. I hope all this helps. Damer That's interesting. I never thought about cardio being related. Thanks a lot! Grip Is Great I start training Grip directly about 5 months ago. I love it and the fact that it is so satisfying.There is a whole community just for grip. https://www.gripboard.com/ Damer are you into Steel bending and other grip lifts like Rolling thunder and Hub ...many more etc.